house of spoon: Life of Jesus...with me daily! Ok so I saw something similar to this in a Christian bookshop, liked the idea of it, but thought I could do a better job myself. This is the finished result, and I love it! 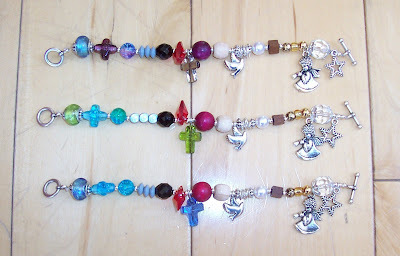 Each bead represents stages in the life of Jesus. I love the fact that it actually means something to me, and it has already been a real encouragement! Actually thought i was ordering single charms from eBay, but when they arrived there were 10 of each.....so i had no excuse not to make a couple more for the gorgeous poog and gill! Changed some of the colours a little bit just to personalise them! 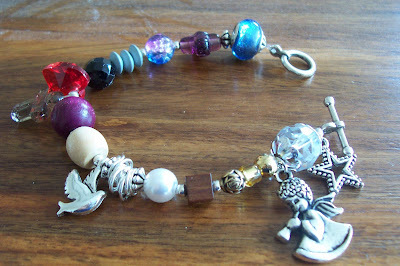 I adore my bracelet - you really are a queen of craft! Can't wait to get it on the old wrist. i love you. Now get more photos of all your fabulous handwork out there! !